Say ‘SAP implementation’ to someone who has been through one and you are likely to get a look conveying some combination of pain, pity, terror and dread (and perhaps schadenfreude). Enterprise Resource Planning (ERP) giant SAP recently announced an approach and suite of applications called ‘Simple’. For a company with a reputation of being anything BUT simple, this casting-against-type positioning could be tricky business; successful transformation will not be immediate. And one look at their recent 2-page WSJ ad indicates they may not yet be fully embracing this ‘Simple’ concept. 5 years ago Domino’s acknowledged that it didn’t taste as good as it should, and used this acknowledgment to justify a reformulation that was the focal point for a new campaign. By many accounts, this bold ‘we sucked, now we’re better’ approach has yielded good results. But ERP software is not pizza – – with pizza, a $10 or $15 mistake and you’re on to someone else. Do a search for ‘SAP Implementation’ and it’s obvious that the stakes are quite a bit higher – – not only $100 million or more, but years of organizational churn and resources, as well as lost opportunity if/when things go awry. You can’t say ‘we know we’ve messed these up in the past, but going forward we’ll be awesome – trust us’. While client’s management often has a hand in screwing things up, at the end of the day, it’s SAP’s name in the headline. SAP has chosen to own ‘Simple’ as its defining principle going forward. In the ERP space, this is a compelling proposition. And some industry experts are cautiously optimistic. But based on SAP’s history, it’s a tall order – – and prospective clients will certainly have a ’show me’ mindset. Requiring 2 full pages to explain Simple is not a great start. Posted in Branding, Marketing Strategy, New Products, Product Management, Technology and tagged Avon Products, Domino's, Domino’s reformulation, Domino’s repositioning, Enterprise Resource Planning, ERP, Hershey chocolate, HP, pizza, SAP, SAP implementation, Select Comfort, Simple, Waste Management. Bookmark the permalink. 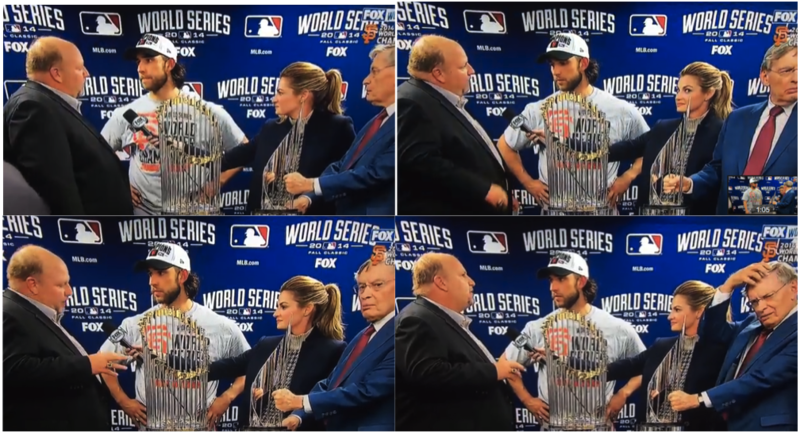 By now you’ve seen Chevy Sales Executive Rikk Wilde’s cringe-worthy presentation of the World Series MVP Award to the SF Giants’ Madison Bumgarner, as reporter Erin Andrews and Commissioner Bud Selig both looked to be trying to flag down a cab. Not surprisingly, this clip immediately lit up the Twitterverse and generated a remarkable amount of media attention (and references to Chris Farley, with whom Mr. Wilde was frequently compared). But perhaps unexpectedly, rather than distancing itself, GM took advantage of it with a wink and a smile, embracing Mr. Wilde’s performance and his instant classic utterance “Technology and Stuff”. Within a few days of the event, there was a full-page ad in USA Today playfully referencing the World Series MVP ceremony. So of course, The Armchair MBA has decided to spoil the moment by trying to extract object lessons from this episode. 1) Expect the unexpected. Speed is key, so be ready. 2) Serendipity can be your friend – be open to improvisation to marketing plans. 3) Consumers like authenticity and the little guy. And they hate to be manipulated. We will use ‘little guy’ in the figurative sense. Mr. Wilde, by virtue of his stammering, sweating performance, reminded us that we’re all human, and if faced with a global TV audience, might be a little nervous ourselves. So in an unplanned way, this helped connect the audience to the product. Unless you, as new parents, know with 100% certainty that your precious child is headed for a career path involving heavy metal bands or the adult film industry, for heaven’s sake, do NOT name him Rikk Wilde. Posted in Branding, Marketing and Media, Marketing Strategy, New Products, Social Media and tagged Bud Selig, Chevrolet, Chevy Colorado, Chevy Colorado pickup, Chris Farley, Erin Andrews, General Motors CEO, Madison Bumgarner, Mary Barra, Rikk Wilde, San Francisco Giants, Technology and Stuff, USA Today, World Series MVP. Bookmark the permalink.